Really lovely, like a leek and potato soup with a sweet, garlic, chive taste. This is the most foodie thing I’ve ever made. I foraged for those flowers. I knew I wanted to do a soup this month. Yes, we have had some sunshine but it’s still pretty cold out there. I was going to do a carrot and cumin soup. I love cumin and I love carrots. It’s funny though how many people only like raw or roasted carrots and they hate boiled carrots. I don’t understand it. 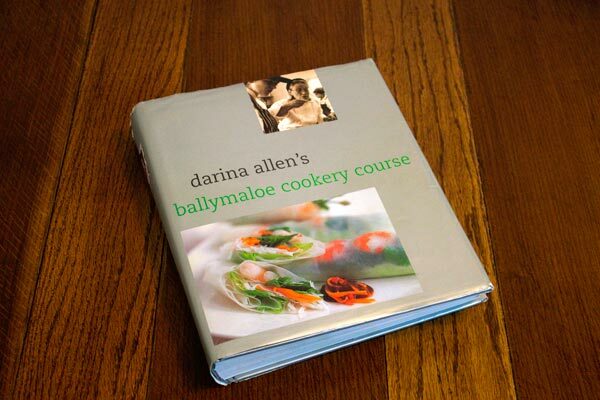 I love them every which way – but anyway I decided to take a good look at the other soup recipes in the Ballymaloe Cookery Course. There is a recipe for Irish Nettle Soup. I had nettle soup once as a child. It was a huge disappointment. 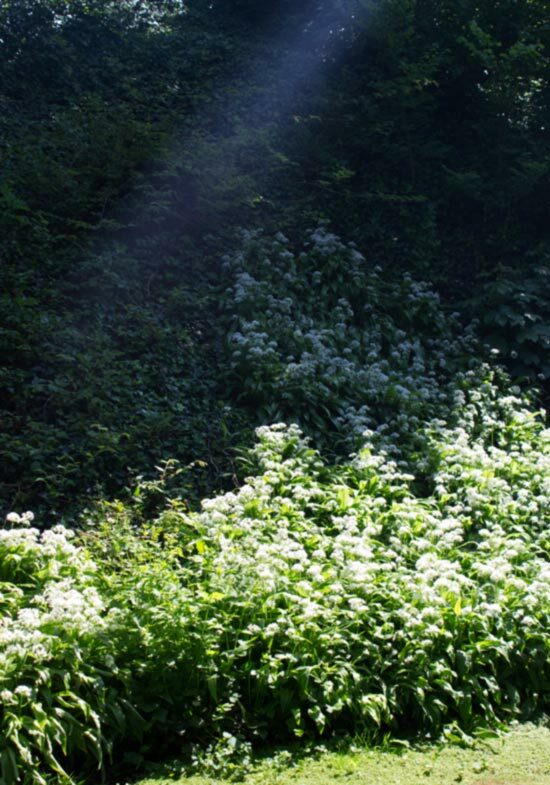 I was the kind of child who was always tripping into cradles of nettles – no point knowing that you take a firm hold of the leaves to avoid being stung when you’re just falling on top of them. They were an enemy but an enemy I respected because you just had to be sure and handle them a certain way and you’d be fine. So, I’m not sure exactly what I was expecting – something dramatic and a bit – I don’t know – with the taste of stingingness? – anyway it just tasted like a normal vegetable soup. Very disappointing. So I was pretty sure I wouldn’t choose the nettle soup recipe until I noticed a little variation on the recipe (the variations in this book are often the best option) using wild garlic instead of nettles. I was definitely intrigued by the idea. At the same time part of the common green area outside my apartment had become blanketed in these lovely white flowers. I’d never noticed them before. Waiting patiently to be discovered outside my back door… Dear Life, could you please please please make everything I’m looking for be this easy to find in future. Does it count as foraging if you just hop over the porch wall with a scissors and snip, snip, snip? I’m thinking yes, yes it does. Mother Earth has fed me and I am most grateful to her. We’ll even forgive the nettles. 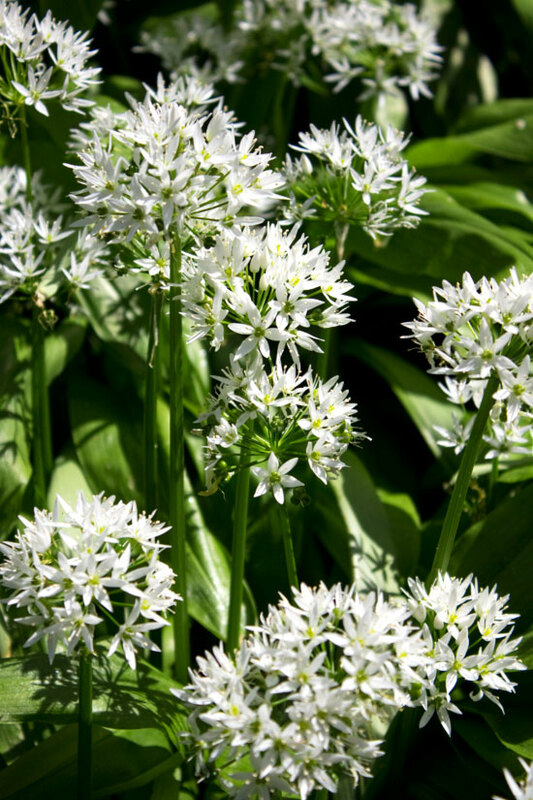 Wild Garlic Flowers – aren’t they pretty? 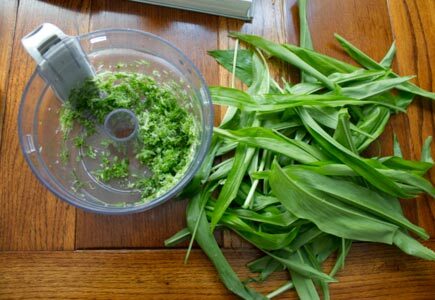 Wild garlic season runs from sort of April through May. The nettles are out in force now as well. The base of this soup is lovely, it’s leek and potato really, so I think the nettles might be very good in this. It’s also important not to overcook the leaves, and I think in the nettle soup that I had as a child the nettles were added at the start, so they had no taste by the time the soup was made. If you want to try the nettle version just use 150g of young nettle leaves instead of the wild garlic leaves. 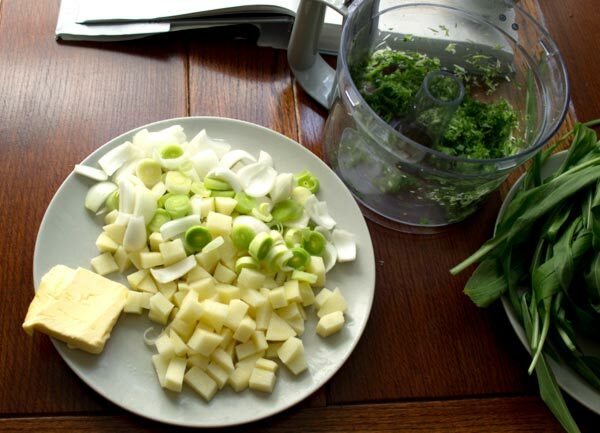 I whizzed the flowers and stalks up in the mixer and added these to the potato, leeks and onion. A couple of things I did differently to the original (I’m just going to give you the original recipe); I blended the soup the before adding the leaves – rather than after – because I wanted to see the leaves rather than have them blended in; also I added both a blend of flowers and stalks to the soup (when I was added the potato and leek), the only reason I did this was because it was much quicker to grab a bunch of the stuff including the flowers and stalks, rather than just the leaves (yes, I’m clearly made for this foraging life). 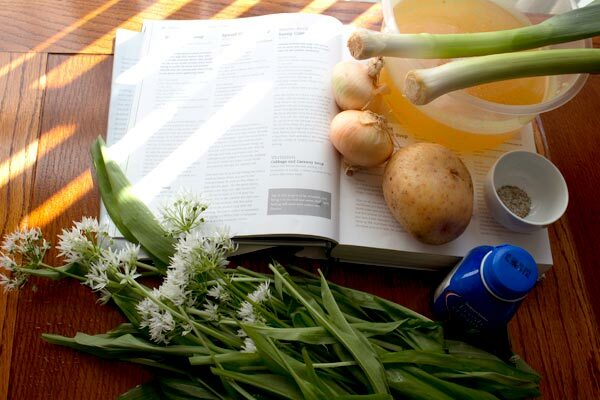 Wild Garlic, potato, onion, leaks, cream, butter, salt and pepper. Forgot to put butter in the ingredients shot. Melt the butter in a heavy saucepan. When it foams add the potatoes, onions and leeks, tossing them in the butter until well coated. Sprinkle with salt and pepper. Cover with a paper lid, or old butter wrapper, then cover the pan and leave to cook until vegetables are soft but not coloured - about 10 minutes. Discard the paper lid, add the stock and bring to the boil. Boil until vegetables are cooked. Reduce heat. You can liquidize now or wait till after you've added the leaves and cream. Add the leaves and simmer for 2 - 3 minutes. Add the cream. Season to taste. 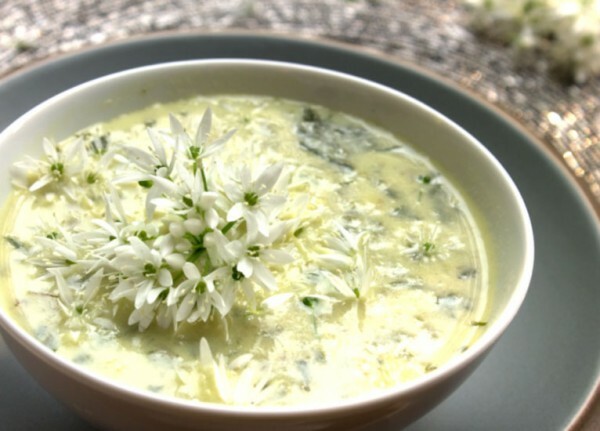 Be sure to top the soup with freshly snipped wild garlic flower - they really add to the taste. 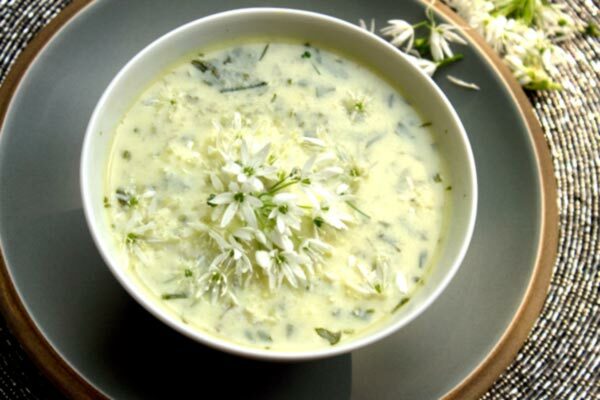 The flowers taste like garlicky chives, be sure to add loads to the soup. So tasty. 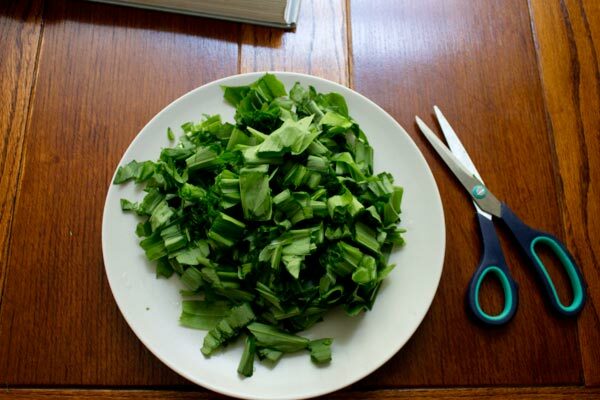 The easiest way to chop the leaves is to bunch them together and use a scissors. Wild Garlic Soup, topped with wild garlic flowers, not just for garnish, they really add to the gorgeousness of the soup.